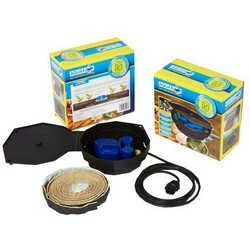 Known as the Aquabox Spyder this kit offers you a easy way to ensure consistent watering for raised garden beds. Easy to set up and install the Aquabox is a low maintenance solution which can be tailored to fit a range of raised beds and will prevent them from drying out. A great solution for providing regular watering and ensuring a healthy high crop yield and it can even be connected up to your Garden Water Butts. The kit contains a patented valve which allows water to reach a set level of 20mm. Once this level is reached the valve will not allow more water in until the 20mm is all used up. This ensures that your plants will never be sitting in water. When the water is used up the valve will automatically allow 20mm to flow again. 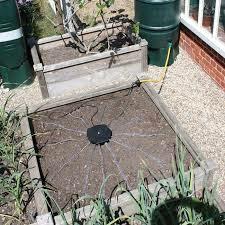 What comes in the Radised Bed Self Watering Kits? 2: Half fill the raised bed with soil. 3: Insert spirit level in Aquabox to ensure once installed on raised bed water will be dispersed evenly. 4: Insert 6mm top hat groumet to Aquabox inlet from outside in. 5: Thread small section the 2 meters of 6mm pipe into the groumet. Ensure to thread enough for easy connection to aqua valve. 7: Place Aquavalve on t connector in the Aquabox. 8: Cut up to 12 strips from the 6 meters of capillary matting to your required length and thread the lengths through the aquabox. 9: Close lid on aquabox and fill raised bed with soil. The matting should slop at a slight gradiant away from the Aquabox towards the sides of the raised bed. This will ensure a good distribution of water.